In the life of an artisanal gold miner, every day is a lottery, but no one ever seems to win. The sun is high on just another Thursday in Tiira, a scattered village in Uganda’s south-eastern corner, 20 miles north of Lake Victoria and within spitting distance of the Kenyan border. At the end of a potholed track snaking off from the parish’s main strip, quiet has fallen over Margaret Ikee’s mine. It’s a hot, languid sort of afternoon. In the entrance to the mine, chickens and barefoot toddlers, roughly matched in number and not far off in size, scurry around on the blood-orange ground. Two tethered goats look on. Bar the odd rooster crow, the only noise is the scrape and thud of spade on earth. Scrape, thud. Scrape, thud. It’s dividing time. On a patch of land between a small shack and a huge opencast pit, 17 local men, women and children patiently encircle a man with a shovel. Each is carrying a primary-coloured plastic basin, waiting for the man to fill it. The clay ore will contain gold. Excruciatingly meagre amounts of gold – a ton holds no more than four or five grams – but gold none the less. 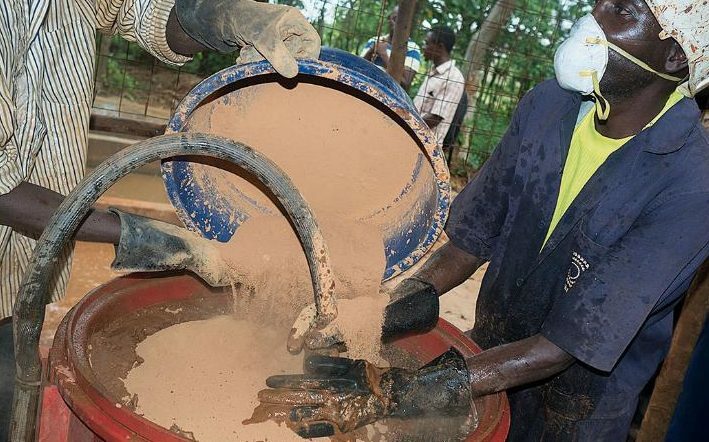 It’s up to them to complete the unimaginably laborious, filthy and dangerous process required to extract the precious metal from their basinful, before middlemen arrive to rip them off, buying it at dubious prices in order to sell it on, often to Indians, at the market in Kampala. From there, via further trading and refineries, it’ll slowly make its way to us – ending up in our jewellery, mobile phones, engineering parts, money or even dental crowns. This is a gold mine, but there are no glinting, booty-laden carts rumbling in and out of dark tunnels on rail tracks; no pith-helmeted prospectors barking orders. Instead, there’s an acre or two of scrappy land, a few huts – some made of brick, some of mud – and a very big hole that dozens of people rely on for survival. The money is horrific, the conditions worse. 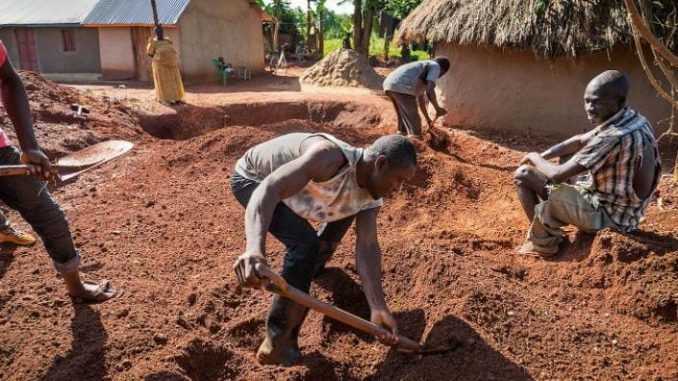 Look hard enough as you cross rural Africa, Asia or Latin America, though, and you’ll find thousands of artisanal small-scale mining (ASM) sites like it. 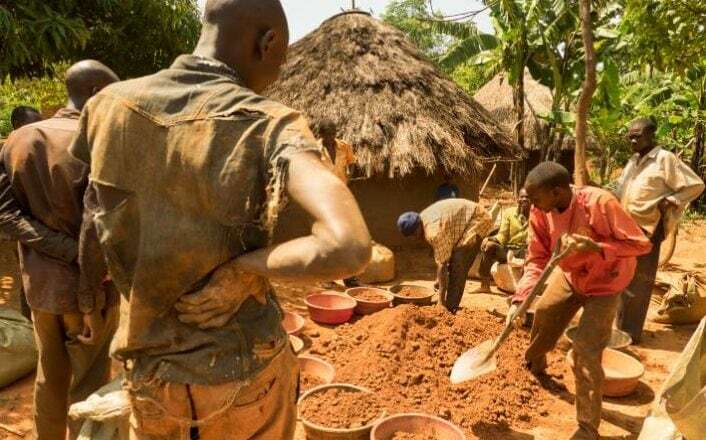 It’s an informal, often illegal industry that accounts for only about 10 per cent of the global gold supply (the rest comes from massive, legally recognised multinational mines), but it employs 90 per cent of the world’s gold miners, most of whom are forced in through poverty. ASM is subsistence living at its most raw: the miners dig not to earn riches, but to earn something. The dangers are endless, from pit collapse to mercury poisoning; child labour is rife, and wide-scale financial exploitation ingrained at every stage. There is little or no regulation, and governments generally either don’t know or don’t care that the miners exist. There’s an impressive new mayor in the Busia District, where Tiira is located, but Uganda’s President Museveni – a man who wrote in 1986 that the problem in Africa is ‘not the people, but leaders who want to overstay in power’, and yet has just celebrated his 30th megalomaniacal year in charge – is preoccupied with closing down universities and coping with the country’s drought. There are glimmers of hope: with the intervention of the Fairtrade Foundation – which has begun a pilot project with nine mines, giving its seal of approval to those that follow a strict code of conduct, allowing them access to a safe, fair alternative supply chain – change may finally come about. But an afternoon wandering around a mine such as Ikee’s shows just how Herculean a task that is. There’s gold in Tiira; everyone knows it. The region this side of Lake Victoria has a rich seam of it carving its way through the quartz veins and bands of iron that lie 20-50ft beneath the surface, and extending well into Kenya. British colonials first mined here in 1932, but since they left, more than half a century ago, attempting to get at it has become the locals’ informal industry – or more often their desperate mission. Along the seam, almost every garden has its own pit, and almost every field has at least three. In Britain, we might pick up a EuroMillions ticket at the newsagent’s hoping to find fortune during a tough week. In Uganda, they dig a hole. Sprawled on a patch of grass behind the gaggle of workers is Ikee herself, the mine’s owner. She’s a plump, giddy 54-year-old in a dandelion-yellow wrap dress, and she oversees the apportioning with feigned lack of interest, perking up occasionally to mutter an order in Luganda, the commonest language in this region. The crowd of workers is, Ikee says, made up of two small groups of locals whose numbers fluctuate from day to day – plus a few Aids orphans she’s taken in, ostensibly with the intention of sending them to school, though in reality this will be unaffordable, so most will end up miners. And so the cycle continues. Many of those present, tools and basins in hand, are much younger than 18, but Ikee insists they’ll go to school soon and just need to earn the money to pay their fees. The daily routine here is much the same as at any ASM mine in Africa. Six mornings a week, about seven men and boys hack away at the opencast pit from 8.30 sharp until early afternoon. The ore dug up, tons of it, is then shared between the families and partnerships within the groups, before being smashed at the ‘pounding’ stage. 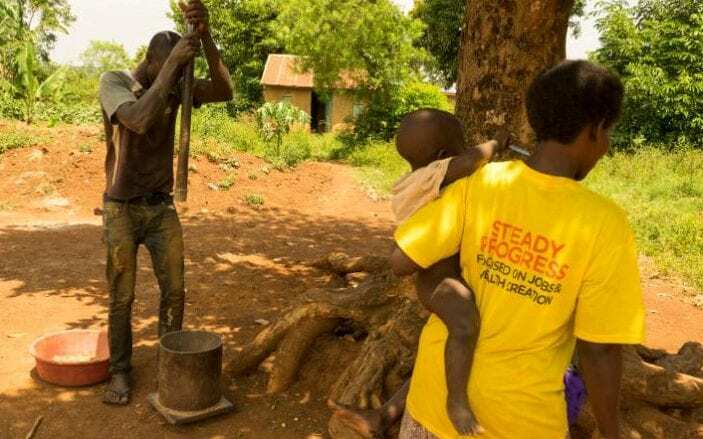 Some artisanal mines have machines to speed up this process, but at Ikee’s it’s done by hand, using a kind of pestle and mortar – if the mortar were the size of a dustbin, that is, and the pestle weighed as much as a lamppost. Next the ore is taken to pools of stagnant water to be washed with bare hands in the basins – often by women ­– during which time it will be mixed with mercury, which amalgamates with any gold particles and sinks to the bottom. That amalgam is then placed in a small fire, burning the mercury away and leaving a speck of pure, 24ct gold. Exposure to mercury, which is bought cheaply at any local market, is extraordinarily dangerous at either of these stages. It can cause – among other conditions – brain damage, digestive problems, kidney failure, a weakened immune system and loss of vision. Inhaling fumes from the fire is a direct way of poisoning yourself and your unborn child; in the washing process, mercury enters the water supply, and those same basins stained by it will likely be used for bathing babies. Evidence of mercury poisoning is everywhere in the area. It’s obvious which children have absorbed mercury in the womb: they are permanently distant, their pupils glazed and fidgety. Staff in Busia’s only hospital – a cluster of squalid buildings with three doctors to look after 150,000 people – are aware of the problem, but very few women manage to seek medical attention. Many ASM workers don’t know of mercury’s side effects, and even for those who do, there are few alternatives: borax would amalgamate but is less effective and more expensive; the only other option is cyanide. I follow one boy through his day. 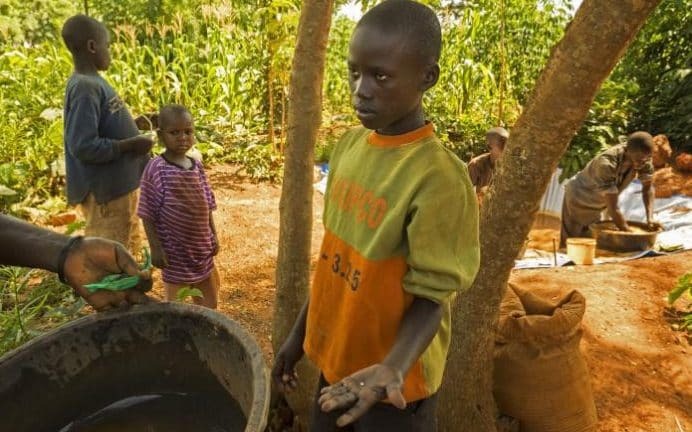 Bryan Elakatite is a 15-year-old who began mining when his father died, two years ago. He’s now working doubly hard in order to provide for his mother when the pits close for a week over Christmas. Elakatite has a determined air and a face that is young even for his age. To look at him is to see the damaging effects of hard manual labour on a growing body: he’s no taller than 5ft 5in, yet he has hulking body-builder arms that burst out from his sleeveless basketball T-shirt. It makes him look like a man-boy hybrid – a bizarre, depressing sight. I watch as Elakatite is allocated his ore and proceeds to pound it tirelessly for more than an hour, then wash it by hand and burn it off. A middleman, who arrives on a motorbike (if you can afford a motorbike to get to and from Kampala, you can become a middleman), then weighs it. The nugget clocks in at 2.58g, an extremely respectable haul for a day’s work, and Elakatite shows it off to our photographer. A crowd gathers to watch the sale. The scales are probably rigged, and Elakatite has no idea of the current price of gold anyway. 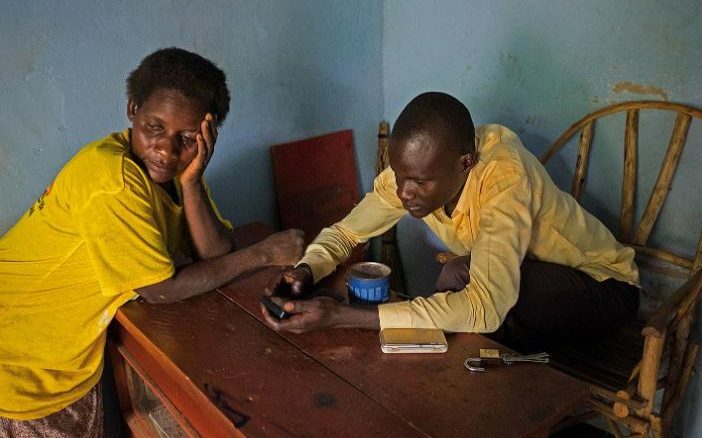 After a moment’s silence, the middleman, who’s only trying to make a quick buck for his own family, pops up from his crouching position to offer 5,000 Ugandan shillings – £1.10. It’s take it or leave it, and Elakatite would be wise to take it: middlemen tend to operate within set patches, so he would have to journey out on foot to sell to anyone else. With a face like thunder, Elakatite snatches the note and stuffs it into his jeans pocket. He has every right to be livid: at the time of writing, the buying price of a gram on the gold market is more than £30. ‘Are you all right?’ I ask him, tentatively. No response. He turns instead to consolatory shoulder pats from two 14-year-old friends, and hangs his head in disbelief. There’s always tomorrow. Ikee and her husband, a major in the Ugandan army who, she says, has rarely visited since their six children moved away for work or to boarding school, came here five years ago, renting the land from an unnamed owner, apparently not knowing that gold lay underneath. In these parts, though, it’s a decent bet. Many of the plots are privately owned, although foreign multinational mining companies, encouraged by the government (that’s one area of the industry the president does attend to) swallow up land wherever the law will allow it – and often where it won’t. The site next to Ikee’s is run by a British multi­national, in fact, but her husband’s military connections ensure the boundaries have stayed where they are, by and large. The couple invited locals to mine shortly after buying, and have so far built two new houses for themselves and their children on site, with another, an impressive brick construction, on the way. After the landowner, Ikee takes the lion’s share of profits. That doesn’t necessarily make her the bad guy in all this. After all, it is she who gives the community employment. Clearly she has her favourite workers, too: for all the talk of fairness, at the dividing stage, some older employees visibly receive more ore than others. The current pit is a vast, terrifying crater at least 150ft wide and about 60ft deep. It would look like a dent from a meteorite strike, were it not for ragged carved steps leading to its base. Once a pit has been dug to the depth of the gold seam, miners chip away laterally – normally until the walls give in. Then they’ll pick another spot and begin again. Frederick Ongaro was down there just this morning. Rake-thin, wearing a torn Manchester United shirt and once-beige chinos, he has been a miner in the area for 20 years. He’s 35. Even in the desperate context of artisanal mining, Ongaro’s earnings are a pittance. 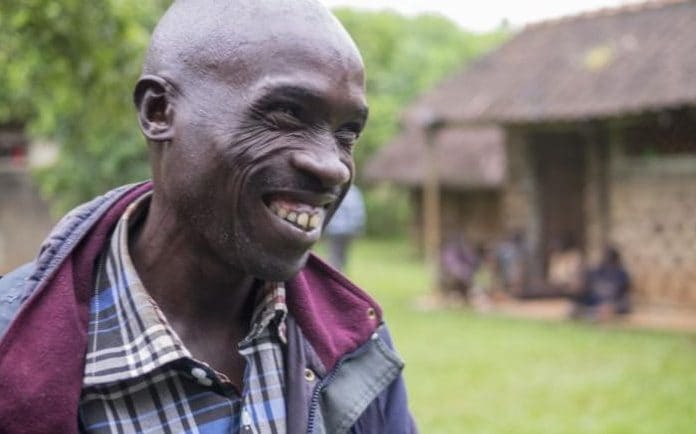 Last year, he says, he made 200,000 Ugandan shillings: a little over £43, or about 14p a day. This must cover the school fees for his three young children. Paid in tiny instalments, these amount to £16.50 a term. There are also uniforms and shoes to buy, and any food that he and his wife, who is unskilled, can’t grow on their land at home. The maths is morbid. Unless there’s a particularly high yield at the mine, the couple must choose between educating their children and facing mounting debt, or accepting that their kids will end up with lives no better than their own. Medicines, mosquito nets and clean-water tablets are out of the question. I note Ongaro’s shirt – it is the latest Chevrolet-sponsored, fake-Adidas offering from Old Trafford, more than 4,000 miles away. Ongaro manages to watch the Premier League occasionally on tiny satellite televisions in bars or at friends’ houses. He comes alive speaking about his beloved club, and asks that we in the British media stop writing off United’s embattled manager, José Mourinho, before the season’s even finished. It’s an oddly protective request. In the time we have been speaking, a little more than 15 minutes, Mourinho has earned more than Ongaro will in a decade. 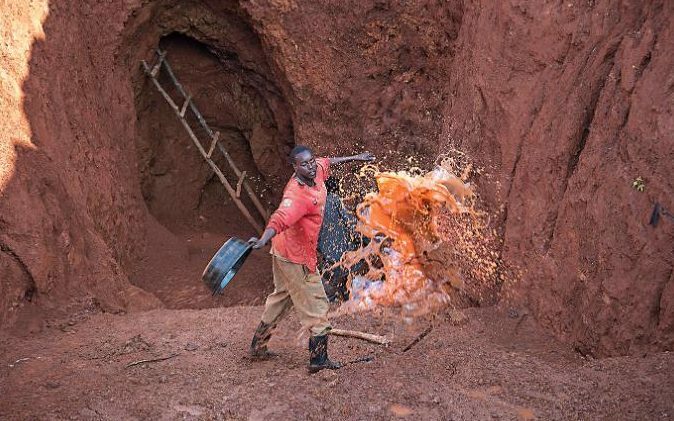 While opencast pits reduce the chance of carbon monoxide poisoning and other risks that occur in deep shafts, there is no concept of safe working practices, and mining in Uganda is fraught with peril. The rainy season is a particular threat: one heavy shower (when there’s rain in Uganda, it is apocalyptic) could cause an earth collapse that would fill the pit in seconds, erasing months of toil and instantly smothering whoever’s inside. Horror stories can be heard all over the region. A few years ago, at a previous pit on Ikee’s land, Ongaro could only watch as two of his friends were buried alive, dying in graves they’d dug themselves. And with any fatality in the pits, there’s usually a widow, or a mother, or multiple children left with no one to support them. All these problems – the exploitation, the mercury poisoning, the child labour and pit collapses – are what Fairtrade is seeking to address with its gold programme. Launched in South America in 2011 and extended to east Africa this year with a Comic Relief grant, the project presents willing mines with an exhaustive list of requirements, from basic health and safety procedures to formal administrative practices and an awareness of environmental damage. If these requirements are met, that mine and its produce will be certified as Fairtrade, receiving the globally recognised logo, and a guaranteed rate of 95 per cent of the internationally agreed price of gold, and allowing it to trade with 14 Fairtrade markets worldwide. In addition, a Fairtrade Premium of $2,000 per kilogram of gold – a kind of bonus it can use to better the community – is paid at sale. The programme has already proved a success in Colombia and Bolivia and Peru, and the organisation is now working with mines across Africa – two in Kenya, three in Tanzania and four in Uganda – to help them gain Fairtrade certification. It isn’t easy: scrupulous audits are conducted every four or so months by an independent organisation, and constant focus is required in order to avoid reverting to bad practice. In late October of this year, though, good news arrived: four years after signing up to the Fairtrade programme, the first gold mine in Africa achieved certified status. Syanyonja Artisan Miners’ Alliance (Sama), a small mining cooperative of 33 men and women, is only a few miles from Ikee’s property, and yet a world apart. Working with Fairtrade and its partner organisation on the ground, EWAD (Environmental Women in Action for Development), a formidably committed Entebbe-based charity led by Margaret Tuhumwire, Sama has cleaned up its act to the point of being the standard-bearer for artisanal mines across the continent. As a rainstorm threatens, Sama’s permanently smiling chairman, 46-year-old Simon Wabwire, offers me a tour of the site. Like a headmaster awarded ‘Excellent’ by Ofsted, he gestures at everything with enthusiasm, glancing back for my reaction. The differences are immediately impressive. Situated between sugarcane fields, the Sama pit is neat and orderly. Wabwire and the men entering the mine wear protective boiler suits and gumboots, for a start, and timber struts strengthen the pit against collapse. As we inspect, five men are shovelling the topsoil away from its brim. Rain may flood the pit overnight, but it will be safe from collapse. For extraction, Fairtrade fundraising has allowed the purchase of a GoldKacha, a machine that renders the dangerous panning stage unnecessary, instead washing heavier elements with mercury (handled with gloves and later burnt in a sealed furnace) and letting lighter particles slip away into a sealed pond. As well as being environmentally friendly, the GoldKacha recovers 95 per cent of gold from the ore processed. Before, as at other mines, only about 35 per cent was recovered. That, on top of the fairer price and the premium, means workers expect their wages to double, at least. In Wabwire’s office, a rudimentary hut on site, the Fairtrade standards are advertised on handwritten posters. Having been certified, the company is registered legally with the local government, and able to teach others about safe practices. ‘All members of Sama will work hard towards the elimination of child labour,’ reads one poster. ‘We must promote unity among the mining community,’ declares another. Women here have enhanced roles, too. Instead of merely cooking for the men, washing the mercury or moving waste materials, as at most sites (Ikee’s included), they have been given administrative posts, providing them with rare financial independence. 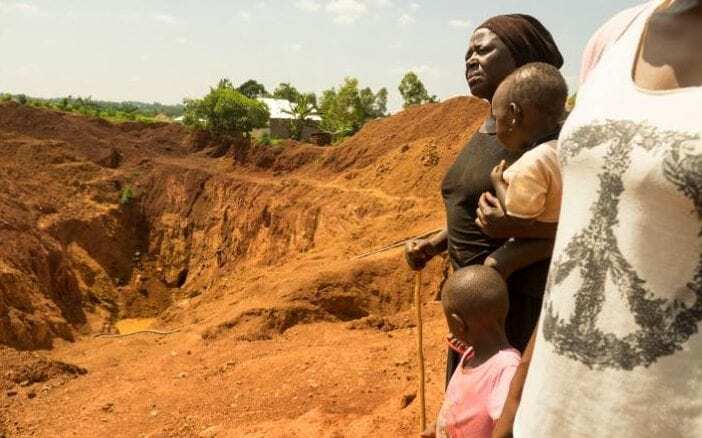 At the moment, Sama is not producing enough gold to receive its first Fairtrade Premium – that ought to come early next year – but once it does, and the other mines follow suit, the onus will be on jewellers and consumers. 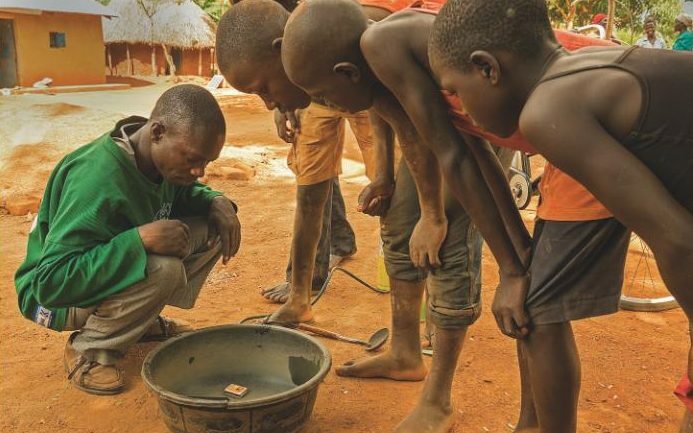 Will people care for Fairtrade gold? Gold continues to underpin the global economy. In times of financial uncertainty, it is viewed as a relatively stable environment in which to invest (this year, with the Trump-Brexit double act throwing markets into chaos, gold has seen a prominent spike). Last year an average of 17.9 million ounces cleared through London each day, worth £16.5 billion. An enormous amount of that has nothing to do with high-street jewellers, of course. 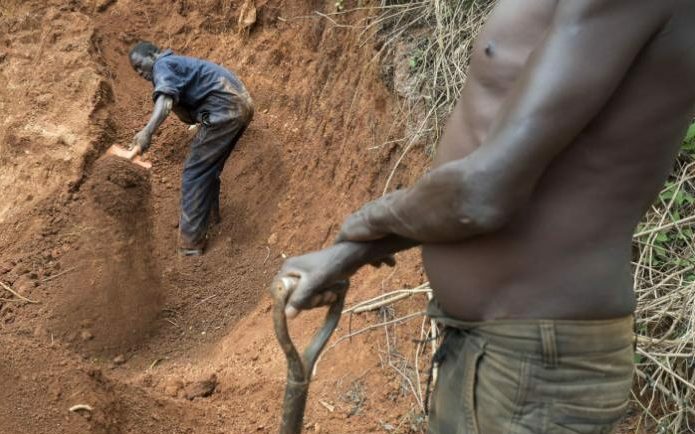 A greater influence on the miners’ lives would be if a multi-national such as Apple – every iPhone contains about 0.34g of gold, most of which is now recycled – were to go one step farther than its ‘commitment to responsible sourcing’ of so-called ‘conflict materials’ by using only Fairtrade. Or how about the gilded president-elect of the United States, while we’re at it? Maybe one day. As it is, sympathetic consumers are the miners’ best hope. Unfortunately, gold is vaguely out of fashion with Western jewellers – platinum’s been de rigueur for more than a decade – but it remains the go-to for wedding bands, at least. Fairtrade-stamped gold costs only a fraction more on the shelf, and Kelsall hopes that those committing to buying something so poignant as a wedding ring might have a rush of conscience, if they knew where it all started. That’s certainly the target of Fairtrade’s #IDo gold campaign, which aims to sell 100,000 Fairtrade gold wedding rings to 50,000 couples, delivering $1 million in Fairtrade Premiums to miners. 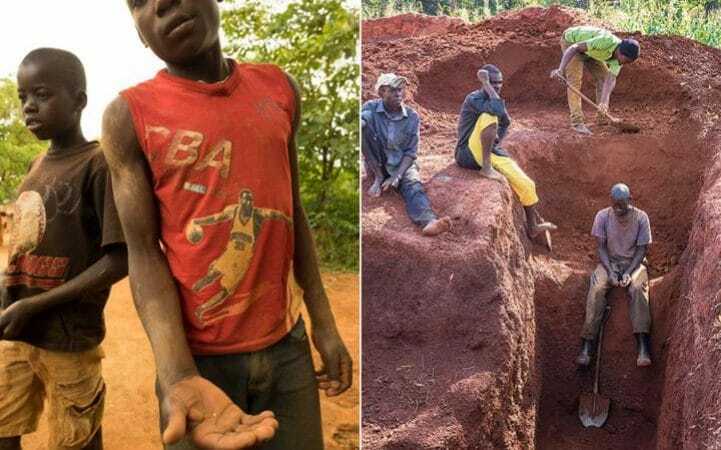 As it stands, without labour-saving machinery to plump up the yield, it takes 60 workers 288 hours of labour to mine the gold needed to make just 250 gold rings – most of which will eventually sell for well in excess of £1,000. At Sama, my tour with Wabwire is reaching a close. Just as we find a seat outside, the heavens open. The men and women at Ikee’s mine will be under threat. Splattering the corrugated-iron roofs of the shacks and barns in the square around Sama, though, the rain sounds like the drum roll of the gods. Still Wabwire smiles that big grin, and looks to the sky. He meets my eye again. Museveni says he’s “not excited” about Uganda’s oil. Is anyone anymore?